It was a LONG ride, coming in over 80 miles. We took the MAX out to Hillsboro and began our ride there. For the most part we meandered all day through small country roads right in the heart of Willamette Valley wine country. Our favorite part of the trip was stumbling upon some quiet gravel roads with nary a car in sight. We arrived in Corvallis tired and famished from the ride. Thankfully, we had a rest day before the madness of the Cycle Oregon Weekend began. 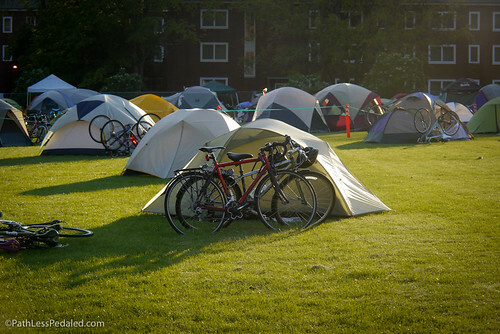 On Friday, we rode to the OSU campus, registered and then set up our tent on campus. We got there fairly early so we were able to find a spot by some trees. In a few hours, people trickled in and the field became a tent city! 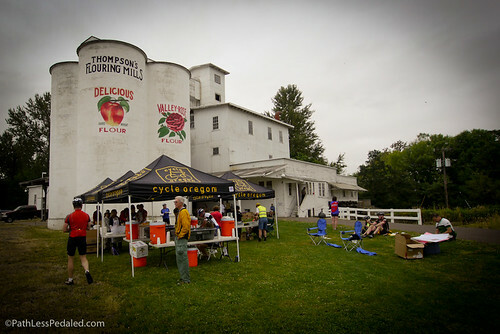 That night, we walked around the grounds and chatted with some fellow cyclists. We ran into quite a few readers which is always a treat. The folks camped next to us followed our trip to New Zealand and were planning their own NZ tour in January. We gave them a few tips of where to go and what to avoid. Later in the evening we had a few drinks at the beer garden and listened to some music on the main stage. This was our first ever “event” style ride and after years of fully supported touring this felt pretty luxurious even though we were still in a tent. We crashed out fairly early, still tired from our ride from Portland and rested for the next day. The next morning we got up bright and early (with about 2200 other cyclists!) had a quick breakfast with bleh coffee (sorry, Portland coffee has spoiled us) and hit the road. We opted to do the medium length rides on both days since we knew were going to be stopping a lot to take photos and video. One thing we did enjoy immensely was pedaling along and seeing we were traveling at a decent clip of around 15-18 mph! Much faster than our turtle like touring pace. 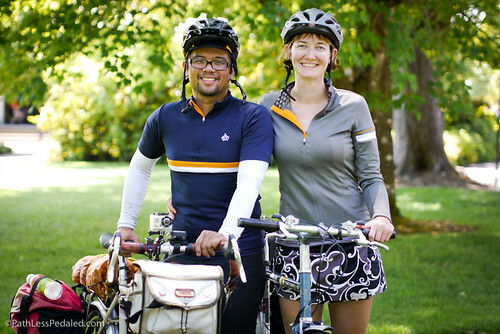 It was good to know that beneath the piles of all our panniers, we can be pretty zippy bicyclists. 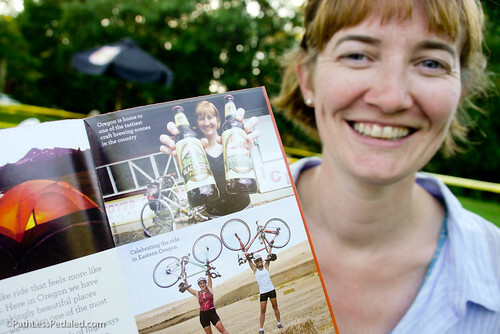 On the evening of the first day, we had some wine in the beer garden and spotted a copy of the new maps of the Oregon Scenic Bikeways, which featured some of our photos form our recent trip out there. The second day, some clouds rolled in and there was a forecast for strong winds. We got up fairly early and banged out the miles quickly but still stopped at all the rest stops (what a luxury!). 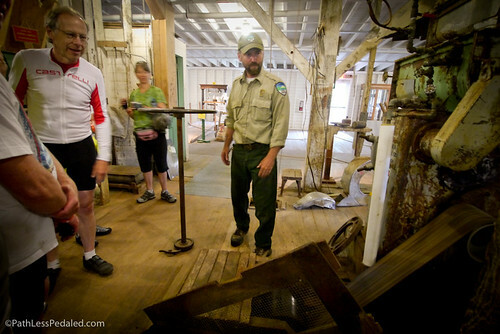 We even got a tour of an old water-powered mill. 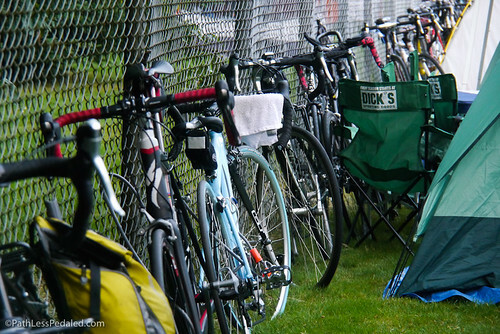 At the end of the second day, Cycle Oregon rolled out the red carpet for the cyclists at the finish. There was a balloon arch and a small squadron of cheerleaders, as well as a freezer truck full of ice-cream. 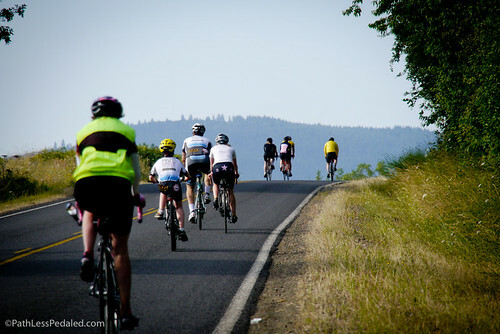 Cycle Oregon Weekend was our first ever event ride and it was definitely different from what we were use to. Although the camping wasn’t quite as scenic, it felt pretty pampered to have rest stops with local volunteers serving sandwiches and fresh local fruit (if only that would happen on all our tours!). We had a great time and it was nice to have a few days where all you had to do was pedal your bike and everything else would be taken care of. 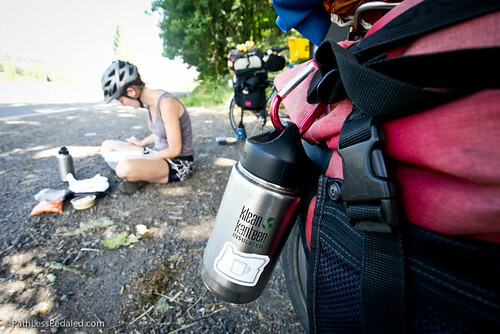 With such a positive experience with the weekend ride, we hope to one day get a chance to do the full week ride and really get the full Cycle Oregon experience. Articles like this is why Bethany and I follow your stories like other people keep up with celebraties. We love you guys and reading about all your trips. It has been my dream since I started building bikes at 11 to tour like you do. I always wanted to be a modern day tom sawyer on a bike and your stories and updates let us live that part of our life we have been dying to do. Ah… I saw you guys out there and wondered who you were reporting for. Nice pics and post. Can’t believe you rode to the start of the ride! I found day 1 super challenging. It was great seeing all those riders in town. I saw hundreds of them coming down from Alsea Falls as I was riding up the opposite way. 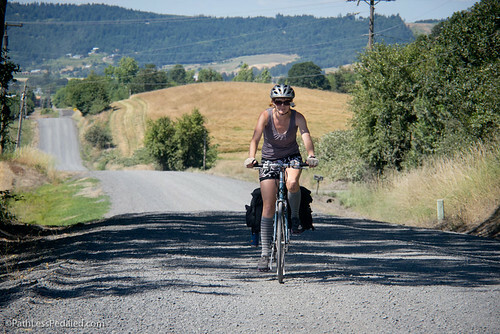 I really appreciated the shouts of encouragement as I was sweating up the very steep grade on my loaded touring bike. I could have done without the one girl who shouted ‘almost there!” when I still had a mile to go, but hey that mile went by really fast for her. When I got to the top I was treated to a free lunch as I was just another guy in cycle clothes. No one even seemed to think it was weird when I parked my fully loaded bike next to their carbon speedsters. I have done organized rides, but nothing like this. 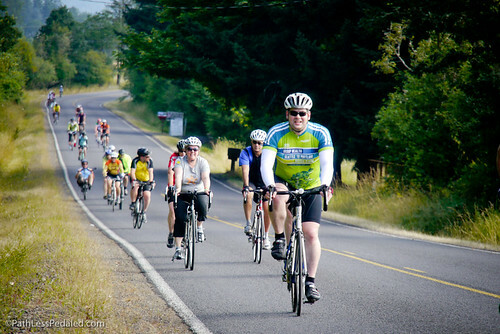 Hats off to Cycle Oregon for putting on such a great party. Hey! 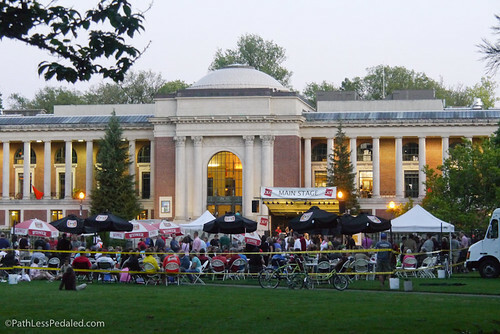 We saw you guys at McMenamins, busy poking away at your laptops… Glad to see you were actually putting up this stuff! Come to Kansas some day and do the Bike Across Kansas ride. Lots and lots of long, rolling hills (and usually wind! ), but it’s not as “flat” as most people think. Love your site. Thinking about doing some short tours to see if longer ones would be something that suits me. Your videos have certainly inspired me! Thanks to you both! 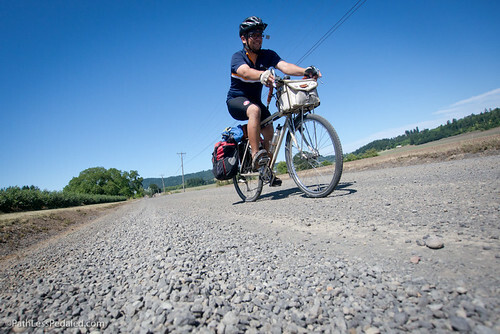 We also rode to the ride on Friday, a serpentine, but leisurely 110 miles from Burlingame in Portland. I think you missed something special not doing the long ride Saturday, The Alsea valley was beautiful with lots of trees for shade during the climbs. Your photos are excellent. Where are your Bromptons? I thought it was a real bike for commuting and the real journey. I miss them in your posts. 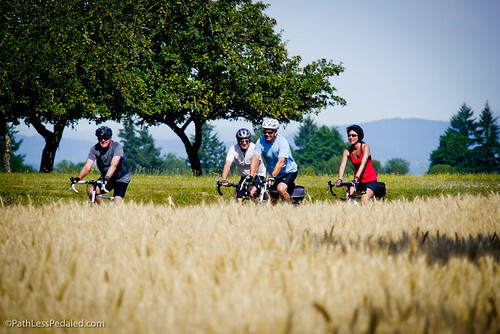 Good to see you guys on some of our Yamhill County backroads. They really are nice to ride. I’ll send a photo of Janet’s Budda’s Eyes headbadge from Wales! I did three days of RAGBRAI with my sister a few years ago (although we carried our own stuff). Really enjoyed the rolling community that a large ride provides. Since we weren’t riding very fast, I was able to strike up many great conversations with those slowly passing us. I hope to get a chance for that kind of ride again some day. I love to bicycle but am good for only about 35 miles per day when I do go. What an exhilarating way to travel anywhere, and so good for the body and soul. I rejoice when I travel to a new city and see a lot of bikers on the road. Laura, I love your video on You Tube, where you explain the features of the roomette on Amtrak, the Pacific Parlour Car, the showers, and so on. What a personality! 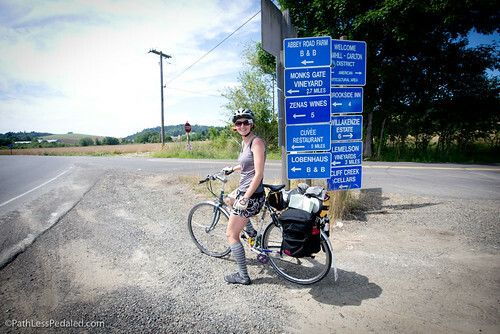 Huntington, WV needs a presentation for PATH, a 26 mike bike trail now being built. PATH is short for the Paul Ambrose Trail for Health, named after Dr. Ambrose, a promising young physician who was killed in the terrorist attacks of September 2001. Just Google PATH, and go to the contacts link.